On April 7th, 2010, Peter Traub will premiere a new work performed by flutist Wayla Chambo – Passages and Recesses for solo flute and hybrid space. 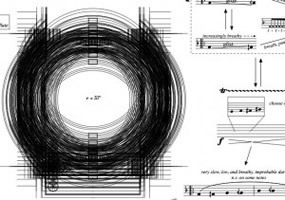 This is the fourth piece in his dissertation series and is the result of a technical collaboration with Eric Montgomery, a recent graduate in computer science and music from UVA. Eric will also premiere a new piece for solo piano and hybrid space, called Sound Across Grounds, performed by pianist Benjamin Yobp. Each piece will be performed from a different space – Eric’s from cavernous the Main Lounge of Newcomb Hall, and Traub’s from the resonant upper stairwell of Old Cabell Hall. They will acoustically connect their respective spaces via the network with the Dome Room of the UVA Rotunda – a United Nations World Heritage Site and the architectural heart of the campus. The program will start at 12:50 p.m. in the stairwell. There will be a fifteen minute break in-between pieces to allow listeners to change locations for Eric’s piece. The event is the culmination of a project funded by a Double Hoo Grant, an award given out annually by the Center for Undergraduate Excellence at UVA to encourage collaborations between graduate and undergraduate students.